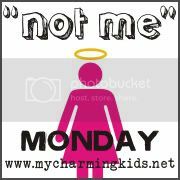 It's time for another Not Me! Monday! This blog carnival was created by MckMama, who has not been able to participate with us this last couple of weeks because they were busy with miracles in their neck of the woods! However, I do believe that MckMama will be able to Not Me with us this week, so after you get done here, jump on over to her blog, see what all she's Not been up to, and then party along with the rest of us! I certainly did NOT torture any of you who may be following me on Twitter with my rants during the Colts/Patriots game. I'm NOT any kind of a sports fan. I also did NOT have such an adrenaline high that sleeping seemed like it would be impossible. Finally, I did NOT end up waiting until almost 5:30 Monday evening to post this! Why on earth would I do such a thing, knowing that work today would be insane, and that the post was written!? Sigh. Be sure to share with us all the fun things you've NOT been doing- either in our comments, or on YOUR blog! Link up here after seeing what MckMama's NOT been up to! I do NOT bribe B all the time to try things, and most of the time he likes them once he takes that first bite. The kids so do NOT drive me crazy with that whole "I won't like it" mess and then end up liking it. We've had to do a lot of bribing.